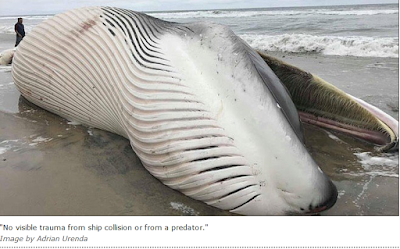 stock here -- first I promise below to tie this dead Fin whale into Kayne West--yes it can be done. We have been talking about the "Slightly Overblown" description of the Death Of The Pacific for many years, predicting it actually. This article from 2015 is 61 pages of hyperlinks to said demise. ship impact or the like. A team went to study cause of death, but nothing has been released. Urenda, like the others present, took photos and videos of the carcass. The residents that live close by aren’t so amused by the carcass. Many are worried that the rotting scent will travel into their homes and stick on their linens and clothing. Cota used to work for PROFEPA (Procuraduría Federal de Protección al Ambiente), which is the agency in charge of the care and preservation of the environment throughout Mexico. He said that his contact in PROFEPA and their team of biologists, went to the site on May 21st to do the official investigation of the carcass to determine the cause of death. here is how--Kayne with this necessarily succinct tweet, but brilliant. Sigmund Freuds newphew ties directly into CIA and propaganda, and the advent of "consumerism" which is a big problem with environmetal over burden.